Why do monsters have such lasting popular appeal in film and literature? From medieval dragons to intergalactic aliens, monsters reveal our fascination with the supernatural and the grotesque, with scientific experimentation and the boundaries of what it means to be human. Every culture has its own way of representing the unknown and sublimating its deep-seated fears of contamination and invasion—often through the figure of the monster. 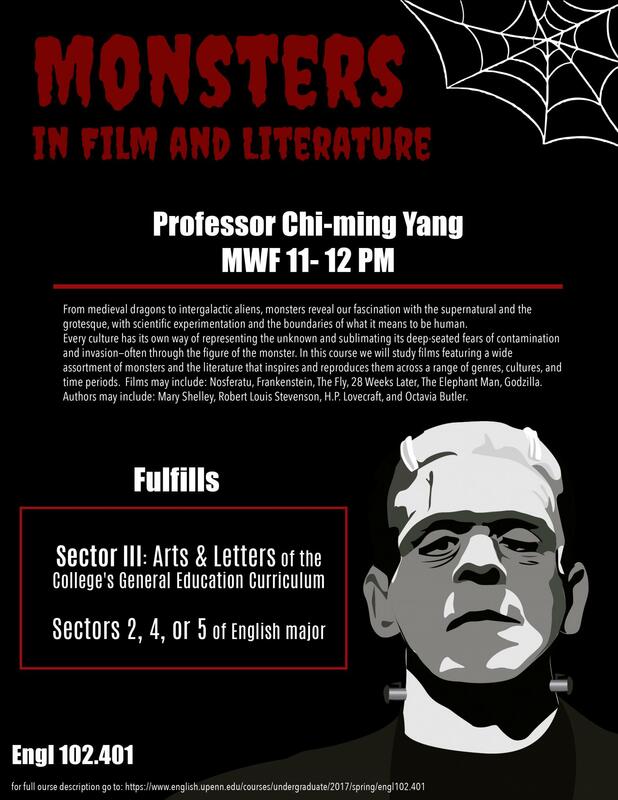 In this course we will study films featuring a wide assortment of monsters and the gothic and science fiction literature that inspires and reproduces them across a range of genres, cultures, and time periods. Films may include: Nosferatu, Frankenstein, The Fly, 28 Weeks Later, King Kong, Freaks, Alien, Godzilla. Authors may include: Mary Shelley, Horace Walpole, William Beckford, and Octavia Butler. This course includes an introduction to film analysis and readings in cultural studies and literary theory. There are no prerequisites. Mandatory film screenings are scheduled once a week in the evenings on Sundays 7-9:00 pm. Assignments will include quizzes and in-class exams, two 4-5 page essays, and a collaborative research project on a monster of your choice. please see below for contact information and office assignments.